The TR LOG design philosophy is to give you the most information possible at all times, and to make entering contacts as intuitive and fast as possible. Having more contest information at your disposal all the time can help you make better decisions during a contest. 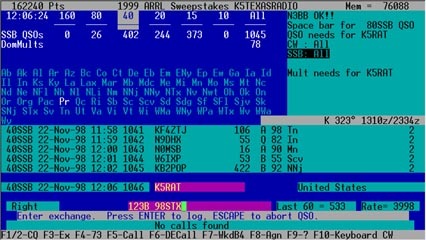 Being able to enter QSOs with a minimum number of keystrokes, without ever having to hit backspace, gives you more time during the contest to do other things. TR LOG is all about elegance, simplicity, and performance - helping you do the most during your limited contest operating time. TR LOG displays information without windows. See everything all the time!